The India-Iran-Russia-led International North South Transport Corridor (INSTC), which is a sea, land and rail transport project, is ready for its operationalisation in June, even as China’s multi-billion-dollar One Belt One Road (OBOR) initiative remains riddled with challenges and will take years to become reality. “If everything remains okay, we will send the first consignment of goods to Russia by using INSTC’s Mumbai-Bandar Abbas-Qazvin-Astra-St Petersburg route in June this year,” a senior official of the ministry of commerce and industry said on the condition of anonymity. The official described INSTC as “game changer” and said the consignment will be first shipped from Mumbai to Iran’s Bandar Abbas port and then it will be carried by trucks to the Iranian city of Astara via Qazvin and from Astara to St Petersburg by railway. This move, as per the official, will cut down cargo transport time from India to Russia by nearly 16-17 days from 50 days which it takes today reaching Moscow through Netherlands’ Rotterdam port. What seems to have emboldened India’s bid to transport goods via the Bandar Abbas-Qazvin-Astra-St Petersburg route in the next three months is Russia’s move to run on trial basis two timber loaded trains – first on February 8 and second on March 5 – to Iran via the Astara (Azerbaijan)-Astara (Iran) rail line. Even as full-scale operationalisation of this rail route is expected to be held soon, Iran is keen to stretch it from Astara to Rasht, Iran’s largest city on the Caspian Sea coast which was once known as the Gate of Europe because of its connectivity to Russia and Europe. Distance between Rasht and Astara (Iran) is 167 km. Azerbaijan has agreed to provide Iran 50 percent loan of the total $1.1 billion required for the construction of the Rasht-Astara rail line. While construction is expected to start soon, Iran’s vice president for planning and strategic supervision Mohammad Baqer Nobakht was quoted by a Tehran-based news portal as saying that “the Qazvin-Rasht rail line will get completed by the end of this year”. According to a media report, the 164-km Qazvin-Rasht project started in 2004-05 has made 80 percent progress. Once it is completed, Iran will start linking Qazvin with its Bandar Abbas port in order to have a seamless connectivity up to Central Asia, Russia and Europe. Besides India, Iran and Russia, INSTC partnership includes Azerbaijan, Kazakhstan, Armenia, Belarus, Tajikistan, Kyrgyzstan, Oman, Syria, Turkey, Ukraine and Bulgaria (as an observer). Finland, Estonia and Latvia have also expressed their desire to join INSTC. Since India and other stakeholders of INSTC want non-stop movement of their goods from one end to other and that they should not be subjected to checks by custom officials at the border of countries falling on the INSTC route, a coordination meeting of countries of this multi-model transport initiative is expected to be held in Iran which also hosts the INSTC secretariat. During his February 15-17 visit to India, as per a senior official of the ministry of external affairs, Iranian president Hassan Rouhani was urged by India to call the INSTC coordination council meeting and he had promptly agreed to do so soon. Justifying the need to call a meeting of INSTC’s stakeholders, the official of the ministry of commerce and industry said that until it is held, businessmen willing to send goods from India to Russia or vice versa will always be confronted with banking, insurance, and customs problems. In fact, soon after its first dry run on Nhava Sheva(Mumbai)-Bandar Abbas(Iran)-Tehran-Bandar Anzali (Iran)-Astrakhan (Russia) and Nhava Sheva-Bandar Abbas- Baku (Azerbaijan) routes in March 2014, stakeholders had demanded removal of bottlenecks, filling up missing links in the INSTC route, and addressing customs, banking and insurance problems. “Some of the deficiencies identified by the dry run are irregular shipping services from India to Iran, lack of insurance coverage and others,” the then minister of state for commerce and industry Nirmala Sitharaman said in a written reply in the Lok Sabha on March 20, 2015. She also said that “since INSTC agreement is a multilateral agreement, the measures to rectify these deficiencies and tentative timeframe decided for operationalising the INSTC require discussion with the concerned stakeholders”. Such views got reflected at the 6th INSTC coordination council meet in New Delhi on August 19-21, 2015. India called for the setting up of two working groups, one on customs and the other on commercial and operational issues. In that meet, participating countries also decided that the experts group will meet every six months to review the implementation of the decision taken. Following this, Moscow agreed to hold the first working group meet on customs in November 2015. Since India and Oman were not part of the Transports Internationaux Routiers (TIR) convention which aims to help boost trade through smoother movement of goods across territories, the INSTC working group on customs asked these two countries to become its members. On June 20, 2017, India ratified the TIR convention after the government approved it in March last year. “By joining the convention, the need for inspection of goods at intermediate borders as well as physical escorts en route shall be obviated due to reciprocal recognition of customs controls. Customs clearance can take place at internal customs locations thereby avoiding clearances at border crossing points and ports that may often be congested. Movement under the TIR can be allowed by checking only the seals and external conditions of the load compartment or the container thereby reducing border delays, transport and transaction costs thereby leading to increased competitiveness and growth for the trade and transport sectors,” the central government said in its official statement on March 6 last year. But since resolving commercial and operational issues regarding the movement of cargos on the INSTC route was also a concern among the participants of the international multi-model transport project, Tehran hosted an INSTC working group meet in January 2016 to discuss port facilities, visa and other logistical issues. As report prepared by the working group needed approval at the highest decision-making level, the forthcoming meet of the INSTC coordination council in Iran is considered important. An overwhelming feeling among officials is that India’s growth story will make an interesting read when the INSTC connectivity programme becomes reality. “Our trade with Russia is barely $6.5 billion currently and by 2025, it needs to be $30 billion. With the INSTC connectivity plan on, it appears possible to hit that trade target,” the official of the ministry of commerce and industry remarked, adding India is also trying to increase its footprint in trade and commerce in Azerbaijan, Kazakhstan and other countries of Eurasia. As per commerce ministry data, in 2016-17, India’s trade with Armenia stood at $31.38 million, with Azerbaijan $501.94 million, Belarus $210.73 million, Georgia $122.45 million, Kazakhstan $642.16 million, Kyrgyzstan $31.93 million, Moldova $18.45 million, Tajikistan $42.26 million, Turkmenistan $78.92 million, Uzbekistan $155.51 million, Ukraine $2,791.63 million and Russia $6,593 million. In total more than $11.2 billion worth of trade took place between India and the countries of the Eurasian region in 2016-17. In 2015-16, it was $9.67 billion. India being a part of the Ashgabat agreement, which aims to establish an international transport and transit corridor linking the Central Asian countries to Iranian and Omani ports, has further synchronized New Delhi’s efforts to operationalise the INSTC project. 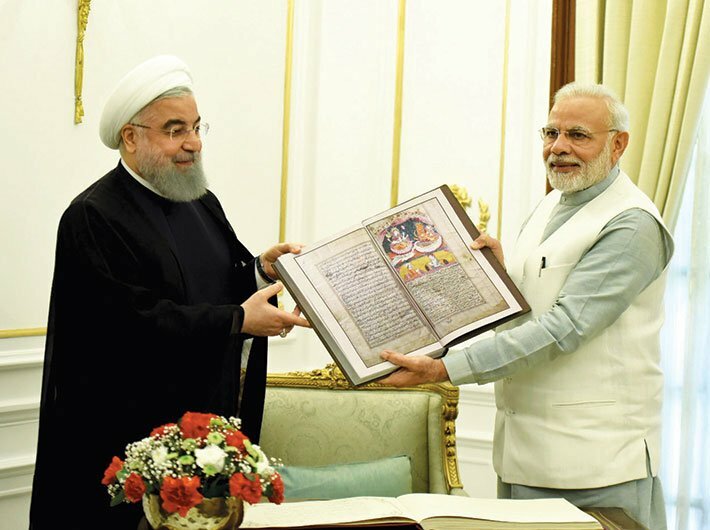 But the real game-changer in India’s outreach towards Afghanistan and Central Asia, according to experts, will be Chabahar Port whose first phase was inaugurated in December last year by Iranian president Rouhani. The port opens a new transit route between India, Iran and Afghanistan, while bypassing Pakistan.